06 Feb 2019 --- One in three hospitalized adults is at risk of malnutrition and inadequate food intake is jeopardizing patient recovery and well-being. This is according to the largest analysis of malnutrition in the US to date. 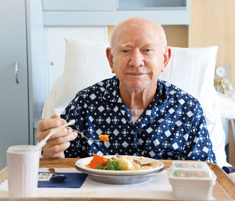 The study notes that most patients consume half of their meal portions or less and that nutrition care, which is underutilized in hospitals, could help improve patients’ health. Published in The Journal of Parenteral and Enteral Nutrition, the study is a collaboration of Abbott and nutritionDay, an organization that aims to fight malnutrition in health care institutions. “Nutrition is easily overlooked as healthcare professionals often focus on a patient’s primary diagnosis. To help reverse the malnutrition trend, providers should screen patients for malnutrition risk upon admission and constantly monitor for signs of malnutrition such as poor appetite or unintentional weight loss,” Abby Sauer, Dietitian at Abbott and lead author of the study, tells NutritionInsight. Despite decades of research on malnutrition, it still remains an unaddressed and widespread problem in US hospitals, according to Sauer. “Nutrition is critical to health and becomes even more important when someone is hospitalized,” she says. “It may come as a surprise to some that when patients don’t get proper nutrition, it can significantly put their health and lives at risk,” Sauer warns. NutritionDay leads one-day surveys of nutritional factors and food intake in hospitalized adults. On a specific day every year hospital wards and nursing homes around the world have the opportunity to participate in a one-day cross-sectional audit. Participants use simple screening tests for nutritional risk. They collect their unit‘s anonymized data and upload it to the nDay database. The researchers used data from 2009 to 2015 and examined roughly 10,000 patients across 245 US hospitals to determine the prevalence of malnutrition risk and to evaluate the impact of food intake on mortality. Fifty-one percent of patients are eating half or less of their meals and diminished food intake is linked to higher risk of death. Adults who ate none of their food had a nearly six times higher risk of death than those who ate some food. Among patients who were allowed to eat but ate nothing, only 11 percent received a nutritional supplement. 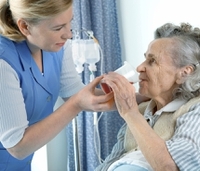 Nearly half of infectious disease and long-term care patients and more than 40 percent of oncology patients were at risk of malnutrition. Click to Enlarge“Malnutrition can be invisible to the eye and is rampant in US hospitals because it's not always top of mind – symptoms, like decreased energy and unintentional weight loss, can often be attributed to a patient’s primary diagnosis,” says Gail Gewirtz, President and Founder of nutritionDay in the US. “However, our data shows that one warning sign – poor food intake – is very common in hospitals, and this is something healthcare providers can easily look out for and address,” she notes. One way to tackle the issue may be supplementation which can boost the patients’ health and help them get key micronutrients. Yet it is important to receive the right amount of daily calories and protein in order to recover. “Nutrition supplements provide calories, protein, vitamins and minerals important for energy, strength and recovery. In fact, numerous studies confirm that nutrition care, including a supplemental nutrition drink, can help malnourished patients and those at risk get the nutrients and energy they need to get back on their feet,” Sauer tells NutritionInsight. “There are a number of factors that come into play as to why patients have poor food intake in the hospital. They may have a poor appetite due to illness or medication or have limited mobility or other impairments that make it difficult to eat,” Sauer says. “Every patient is unique, so it’s important to start by screening those at risk and providing a personalized and holistic nutrition care plan that addresses each patient’s needs. For example, for patients with a poor appetite, providing a nutrition supplement can help them get the nutrients and energy they need to avoid complications, recover and get out of the hospital faster,” she adds. Aid should be provided to patients with limited mobility or other impairments, for aspects such as opening packages and eating utensils. Healthcare facilities need to have alternate food or nutrition options available during foodservice off-hours or if the patient is away during meal times. Consultation with a registered nutritionist for patients with limited appetites, specific nutrition needs or risk factors should be recommended.